2Mesa. Photo by Cari Taylor-Carlson. 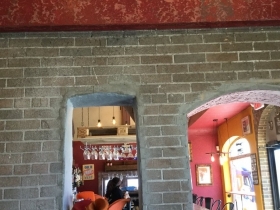 2Mesa, is a small cozy west side restaurant that is Michel Feker’s addition to the scores of local Mexican restaurants. It’s worth trying. 2Mesa is located close to both Miller Brewery and Harley-Davidson’s headquarters on an obscure street just off West Highland Avenue. A location some may recall as the former Birdie’s Café and Highland Pies. In restoring the building, Feker kept the interior bones of this English Tudor building while adding his personal style to the restaurant. The result is a small, warm, inviting space on two levels. The former upstairs meeting room however is currently used as an office. 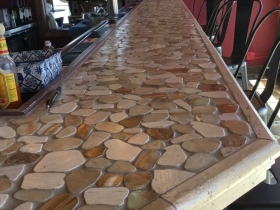 Customers are greeted by a small bar with eight seats and a tile floor decorated with Talavera tiles to add an immediate reminder this is a Mexican restaurant. 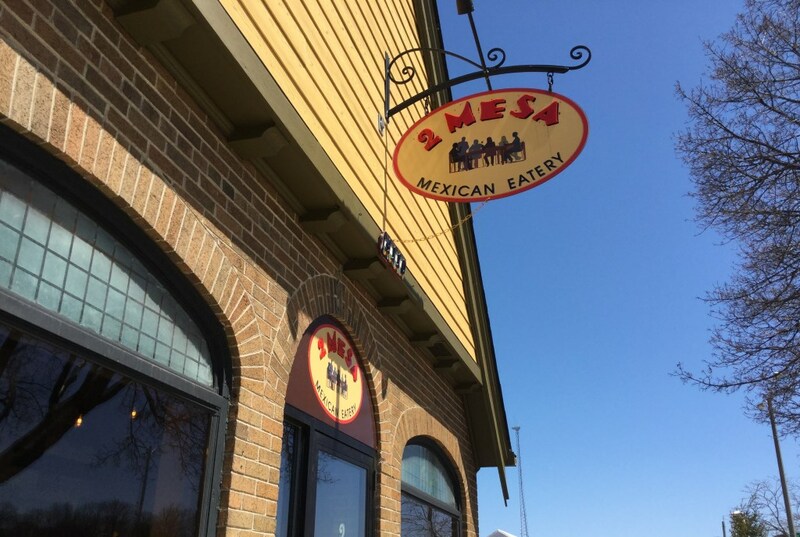 Feker, and his Mexican born wife Maricela, teamed up for 2Mesa, the third restaurant for Feker, who also owns Il Mito in Wauwatosa and Zesti in Hartland. 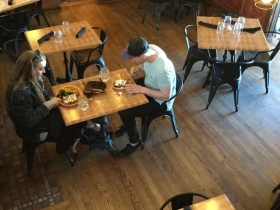 He’s all over the globe with them: Italian in Wauwatosa and a potpourri of European influences along with a sprinkle of Mexican in Hartland. Now he’s turned his attention to Mexico at 2Mesa with a fairly basic menu, starting with breakfast and an impressive dish of Chilaquiles which I recently enjoyed on a Sunday morning. This modest portion of corn tortilla chips topped with scrambled eggs, beans, Cotija cheese, and a drizzle of crema, was drenched with green salsa, my choice instead of red, as per our server’s recommendation. The sauce permeated the dish giving it a bright fresh taste while the scrambled eggs left no doubt about their organic origin. My companions chose the Daily specials, Tostadas and the Burrito of the day. For each dish, they had a choice of chicken, lamb or pork. They chose chicken for the tostados and pork for the burrito. 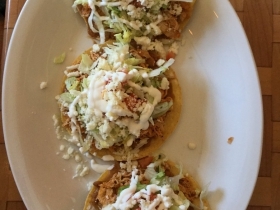 Three tostados, piled with rice, beans, chicken, lettuce, tomato and crema, needed nothing more than a large napkin and perhaps a bib. The chicken tasted like “tinga,” chicken shredded and mixed with a tomato-chipotle sauce. It was juicy and full of contrasting flavors, a satisfying meal with the addition of rice and beans. 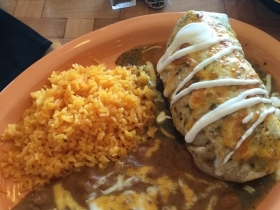 The large burrito appeared overwhelming, but my companion managed to devour every morsel of the pork, beans, and rice, packed inside an oversized tortilla glazed with melted cheese. The chef used slow roasted pork or cochinita pibil, meat that had been marinated in citrus juice, giving it a tart undertone. This hint of citrus peeked through the burrito adding a delicious pop of acidity. You will find more breakfast choices on this brief menu including a Rancheros Omelet and a Divorced Omelet. Feker redefined both dishes by turning them into omelets rather than the traditional eggs served on tortillas with a sauce. For Divorced eggs, the red and green sauces are complementary, not joined. You will also find Bacon and eggs with apple smoked nitrate-free bacon or a Vegetarian omelet on the menu. 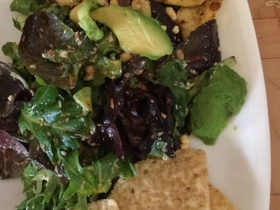 At lunch you can order traditional tacos and enchiladas, or you can look to the salad and torta menu as we did on another visit, trying the Sonoran chicken salad and for a torta, or sandwich, the California. We bypassed tacos as $10.95-$13.95 for three seemed steep in a city loaded with great tacos at multiple restaurants and food trucks. We started with the usual chips and salsa. The triangular corn chips, according to our server, came from a local tortilleria. They were especially tasty. 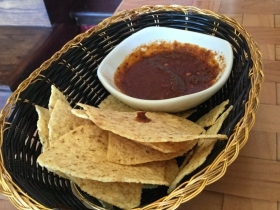 The salsa, a bland smoky mix, gets no kudos. At our request, the server brought a bottle of habanero sauce to bring it to life. The salad, a balanced mix of greens, avocado, bacon, garbanzo beans and shredded cheese, had a generous portion of tender grilled chicken. My companion found it satisfying, if not particularly exciting or unique. The torta, also made with grilled chicken, included caramelized onions, bacon, and Oaxaca cheese. 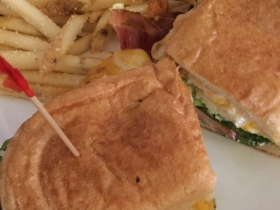 A decent sandwich, served with, according to the menu, “Mexican fries.” They were unexceptional, ordinary fries with a dusting of cheese. Feker can show off his chef chops at dinner where entrees get more interesting including some unusual sauces; Fish of the day with Veracruzana salsa, Mexican style Chicken Schnitzel with creamy lime and serrano sauce, and Pork chop with creamy tomatillo and roasted apple sauce. It’s a short dessert menu, at least for now, just Flan and Churros. The flan looked better than it tasted as it lacked the rich creamy texture associated with the best. It would have been improved with real whipped cream instead of fluff from an aerosol can. I know he can do better. I’m waiting for some memory making desserts. Still, 2Mesa is a nice addition to a west side neighborhood where restaurants are in short supply. Michael Feker is an excellent chef. I wish him well. 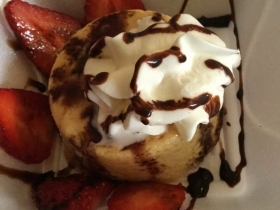 Location: 4110 W. Martin Dr.
Wow,the Menu is so delicious I wish I can get it now.thank you for your wonderful post.